A good size trampoline if space is limited. This 10 ft purpose designed in-ground trampoline kit is the highest specification In Ground on the market. Our innovative design is completely flush to ground and will blend seamlessly into your lawn. You can even DIY on the installation with our helpful guides. A complete kit – This in-ground trampoline kit comes with the trampoline and pads, purpose built retaining wall (which stops the soil falling back into the hole) and clear instructions. 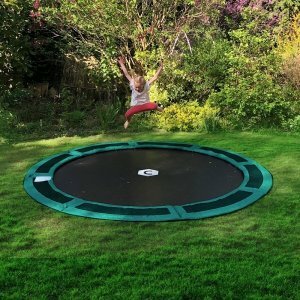 Great fun – Owning a trampoline is a sure way to get the kids outside and away from those screens! Your net options – The beauty of an in-ground trampoline is that you don’t need a net at all! However, we also offer a range of net options, including full, half and quarter nets to suit your needs. Easy to do – Our in-ground trampoline kit are designed to be easily installed yourself. Our website offers some great videos and tips for installation. Kid Friendly – Young children sometimes get frightened being zipped inside a net away from their mom or dad. An in-ground allows parents and children to interact more – mom and dad can stay in close contact at all times. We are the only company to offer full, half and quarter safety net options.